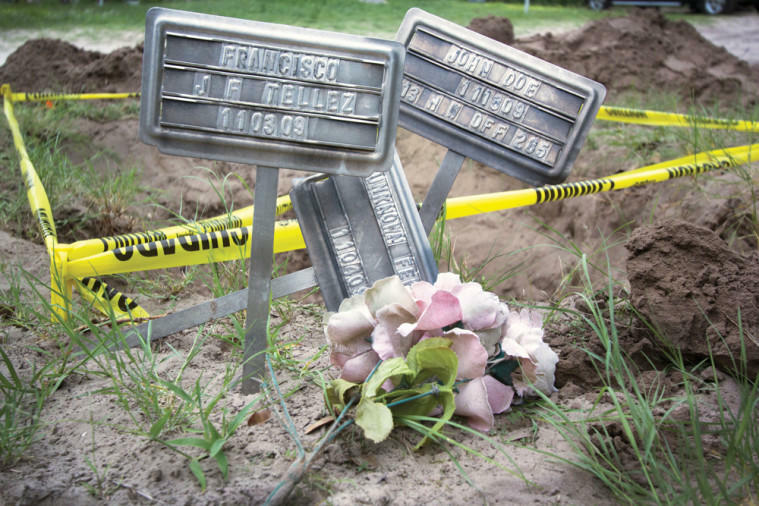 Grave markers next to a Brooks County burial plot marked for exhumation in May 2013 by the Baylor University forensics team. John Carlos Frey, a reporter with the Texas Observer, joins the Texas Standard to talk about the wrong-doings he found while looking into an inquiry led by the Texas Rangers. There is a raft of unanswered questions about mass graves in South Texas near the border in and around Falfurrias, discovered in 2013 by forensic anthropologists. Buried remains — more than 50 bodies — were scattered and unmarked. Bones from multiple bodies were buried together, sometimes multiple bodies in the same bags. Read the rest on the Texas Standard. Over 50 bodies were found unmarked.